Two former Seahawks preseason stars, Christine Michael and Kasen Williams, will be back at CenturyLink Field Thursday with their new team, the Colts. Here's a look at some eager young Seahawks who are poised for breakout performances in the preseason. The Indianapolis Colts come to town Thursday serving as vivid proof of the often misleading nature of the NFL preseason. Two of the 90 players on the Colts’ roster have been Seahawks preseason stars at some point during the past five years — tailback Christine Michael and receiver Kasen Williams — and each is now getting another shot to find a lasting home in the NFL. Michael, signed by the Colts last March after not playing in 2017, was a perennial preseason star during his Seattle career (or to be more accurate, careers) but never more so than during his rookie season in Seattle in 2013, when he rushed for 201 yards, fourth-most in the NFL. Michael, though, wasn’t even really the preseason star that season for the Seahawks. Instead, receiver Stephen Williams turned in a steady succession of big plays to lead the NFL in receiving yards, with 236 on seven receptions and three touchdowns, and earn a spot on Seattle’s initial 53-man roster. If you’ve forgotten Stephen Williams there’s good reason — he was waived by the Seahawks after four games having not made a catch, and he would never make another catch in an NFL game. A year ago, it was another Williams — Kasen, a former Skyline High and UW star — who lit up the preseason, ranking third in the NFL in receiving yards with 208 and turning in a handful of highlight-real-stealing catches. That wasn’t enough for the Seahawks to keep him on the roster though, and he was waived amid much fan, and player, debate — Richard Sherman took to Twitter to let the world know he thought it was a bad idea. Picked up by Cleveland, Williams similarly struggled to transfer preseason accolades into regular season success, with nine catches for 84 yards in seven games and was waived by Cleveland twice before signing with the Colts in May where he joins Michael in trying to revive his career. Some other recent Seahawks’ preseason stars have fared better. Thomas Rawls emerged from anonymity to finish third in the NFL in rushing in the 2015 preseason with 158 yards to foreshadow the surprising success he would have later that season as a rookie (Rawls is now with the Jets). A year earlier, undrafted rookie free agent linebacker Brock Coyle had 23 tackles in four preseason games to rank second in the NFL and earn a roster spot and a three-year stint on the team. He is now with the 49ers. In the early years of the Carroll era, preseason success of the likes of Doug Baldwin, Jermaine Kearse and Russell Wilson gave valid indications of the careers that were to come. But then there are also the stories of guys like Troymaine Pope, who was a late addition to Seattle’s roster and went on to gain 162 yards and lead the Seahawks in rushing. Pope, though, has gained only 44 yards in four games with two teams since then (including a brief return to the Seahawks in 2016) and is currently with Houston, hoping for another shot. So let this serve as your annual reminder that the preseason remains the preseason, where sometimes the stats are meaningful but just as often they are not. Still, reviewing the Seahawks preseason stars of the last few years got us to thinking who might fill that role this season and what it might mean. 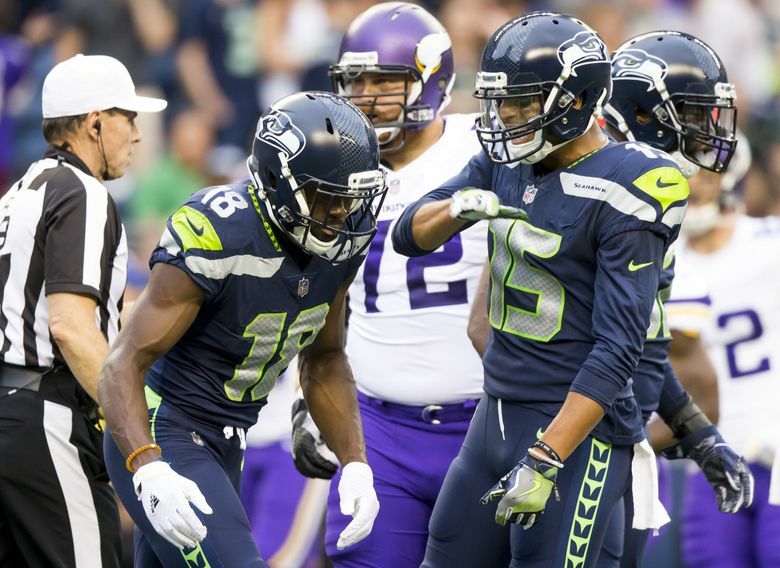 WR David Moore: Moore is hardly off the radar as a 2017 seventh-rounder who was elevated to the 53-man roster late last season, with the Seahawks making clear they viewed him as a potential key part of their future. Still, he has no real experience, getting just nine regular-season snaps last year, and the Seahawks are likely to use him a lot to see what they have after lauding Moore as one of the stars of the offseason program. That could mean putting up some big numbers. LB Shaquem Griffin: Griffin is as heralded as any fifth-round pick can be. But he also remains a rookie learning a new spot behind a veteran in K.J. Wright who doesn’t figure to need many snaps this preseason. The Seahawks figure to also try to put Griffin in some situations to see if he can use his speed to make some big plays. All of which could mean lots of tackles and a few highlights. LB Jacob Martin: A rookie sixth-round pick out of Temple, Martin has gotten a lot of work with the starting defense as a rush end in the wake of injuries to the likes of Frank Clark and Marcus Smith. He’s done enough to far to project as having a serious chance to make the 53-man roster and he will likely get a ton of snaps so the team can see what he can, and that could mean a lot of chances at sacks and big plays. TE Tyrone Swoopes: Swoopes is in a similar position to Moore as a second-year player who got in just one game last season, but who has a legit shot to make the roster and figures to get a lot of playing time to try to prove it. Swoopes also at the moment is the third tight end with starter Ed Dickson remaining on the Non-Football Injury list. QB Alex McGough: Wilson will get the usual starter’s snaps in the preseason which means lot of other snaps to go around to backups Austin Davis and McGough. The Seahawks, though, know what Davis is at this point. Who they need to find out more about is McGough, so the seventh-round pick may get more time of the backup playing time than Davis. McGough has been inconsistent in practices but the team thinks he might be the type of player who comes alive on gameday.